Why not dig a dinosaur this summer?Courtesy Mark RyanAfter exploring the Ultimate Dinosaurs exhibit here at the Science Museum of Minnesota, you might say to yourself, "Gee, I wish I could be on one of those swell dinosaur digs." Of course, the movies and other media have created the impression that working on a dinosaur dig is a romantic and thrilling endeavor full of excitement and constant discovery. In reality, it most likely involves long, sweaty hours with a shovel, removing tons of overburden, walking for miles and finding nothing or lying in the dirt, under a boiling hot sun, carefully uncovering crumbling fossil bones or wrapping them in a sticky concoction of burlap strips dipped in plaster. Afterwards you get to help lift several 3/4-ton blocks of encased bones and rock onto the back of a flatbed truck. If it happens to rain during your time in the field, you'll spend hours, maybe days, stuck inside a humid tent getting to know all about Larry from Cedar Rapids' chronic hip pain, and eating hard tack. Sounds like a blast, doesn't it? So, if you're still interested, then you'll be happy to learn that there are lots of opportunities available out there to join an actual dinosaur dig. Here's a list of several organizations that will be more than happy to let you pay them to do their manual labor for them. Most are located out West where conditions and rock exposures are most ideal for dinosaur fossils but some digs originate with a museum or fossil related organizations in the East or Midwest. Now that I think of it, it does sound like a blast. And who knows? 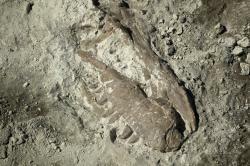 Maybe, if you're lucky enough, you'll stumble upon something completely unknown like a Haplocanthosaurus skull or even the next, great "largest dinosaur ever found" (there seems to be a new one each month). And for all the homebodies out there.